Hey all! Joe here! 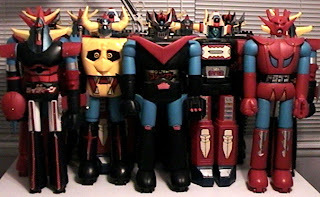 It’s been a while since I wrote anything up and I apologize for leaving everyone Transformers-less. Sadly, that’s not happening today either. I recently attended the Phoenix Comic Con as Media for OnePerCase and was able to hit up a few people that I consider famous and that you may have heard of. Take a peek after the jump to see who! My trip out to Phoenix was to visit my good friend Ken. It just so happened that the weekend I planned on going out was the same weekend as the Phoenix Comic Con. 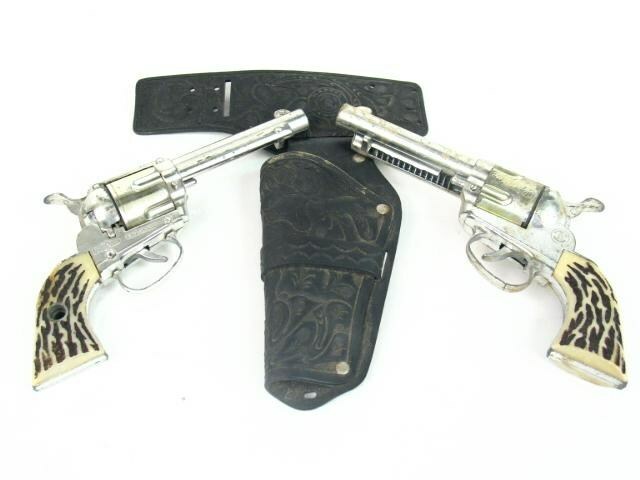 Okay… so it wasn’t a coincidence, we planned it that way. Ken just happens to know a ton of folks in the comic industry who are local to Phoenix, so we spent a lot of time just hanging out with folks he knew. There were a lot of great things to see… plenty of toys, comics, and swag to buy… plenty of cosplayers to check out… some good… some not so good. An amazing group of Joes! Ken loves him some Vader. Darth Elvis?! Nice to see Zim and Gir still making the rounds. What time is it?! This BMO was just adorable. The hottest Borderlands Psycho I've ever seen. Freddy Mercury and Jem out rockin' it. One of the first folks we sat and chatted with was Brian Augustyn. Brian spent many years editing comics for DC and Impact comics as well as Visionary. As a writer, Brian churned out every issue of Wildstorm’s Crimson, Dreamwave’s Mega-Man, and one of my personal favorites, the first DC Elseworlds book, Gotham by Gaslight. As we were chatting with Brian, I had to ask the hard-hitting question; “What was your favorite toy growing up?” As a child, Brian favored die-cast Tonka trucks and the like. 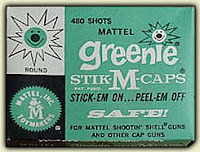 He was a fan of playing Cowboys and Indians using the classic Greenie Cap Guns. When they finally came about, Brian felt he was a little old for the likes of Captain Action and other superhero toys. It just so happened that sitting next to Brian Augustyn, was the man that drew Brian’s Gotham by Gaslight story, Mike Mignola. You may have heard of him, he created this little character by the name of Hellboy. Mike Mignola spent quite a few years drawing for both DC and Marvel before creating his own little mythological monster-filled universe. One of my personal favorites is DC’s ‘Cosmic Odyssey’… the pivotal point in Green Lantern John Stewart’s life where the planet Xanshi is destroyed on Stewart’s watch. Mignola has also spent time as a production artist for films like ‘Bram Stoker’s Dracula’, Disney’s ‘Atlantis’, ‘Blade II’, and Pixar’s ‘Brave’. 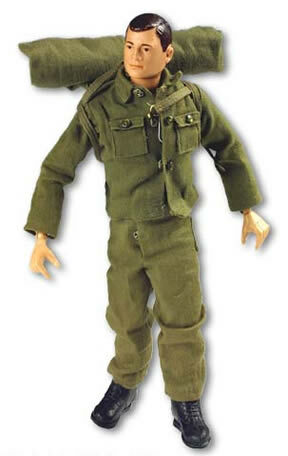 Mike let me know that as a boy, he was a fan of the now classic 12 inch GI:Joe figures. 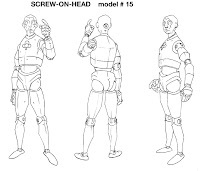 He told me that he actually dedicated the Hellboy story ‘Conqueror Worm’, namely the robot bits and the way the bodies are jointed to GI:Joe. 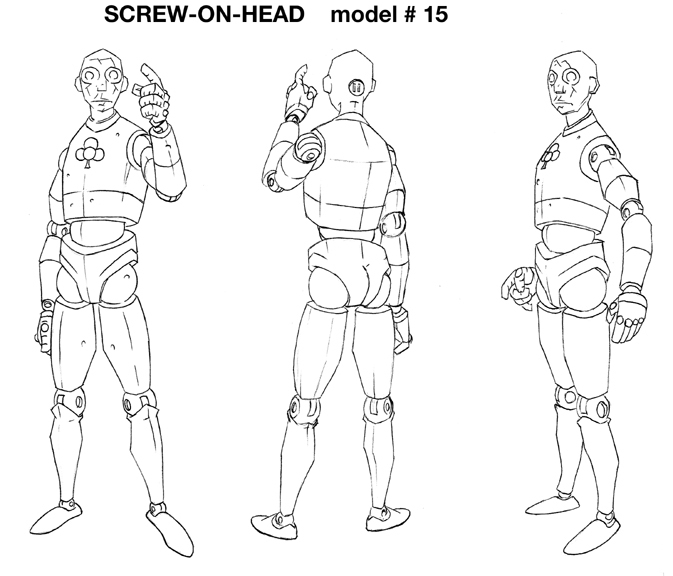 The design for Mignola’s ‘Amazing Screw-On Head’ was also based on classic GI:Joe design. Since Brian Augustyn and Mike Mignola were sitting right next to each other, with a little help from Ken, I took advantage of getting them to both to sign one of my favorite books. 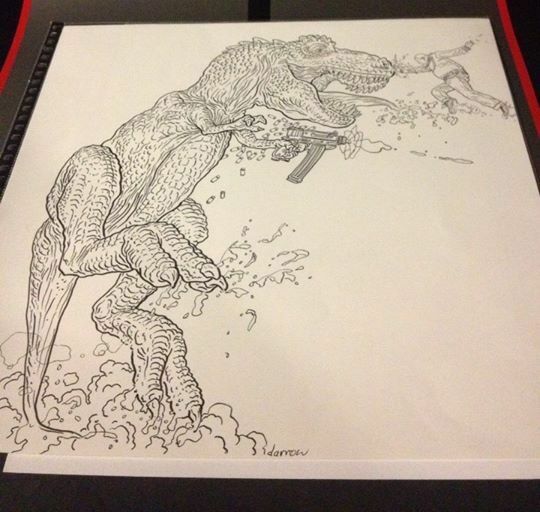 The next artist we came across was the super laid back and excellent, Geoff Darrow. Geoff was the guest of one of the local comic shops, sitting at his table chatting with passers-by and selling all sorts of hyper-detailed goodness. Ken picked up one of Darrow’s unproduced pieces of the Shaolin Cowboy facing off against a T-Rex with a machine gun (duh… what else would it be). Along with writer Frank Miller, Geoff’s two greatest books (in my opinion) were two books he did for Dark Horse Comics, ‘Hard Boiled’, and ‘Big Guy and Rusty the Boy Robot’. Both books were edgey with amazingly detailed art. One of Geoff's newer books, Shaolin Cowboy, came along later, and is an equally fun and quirky book. Looking at his art and books, it only makes sense that Geoff’s answer to my question was robots and dinosaurs. 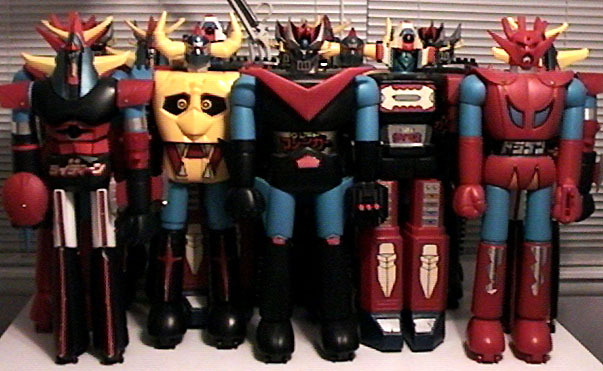 Geoff was a big fan of 3A Robots, Ban Dai figures, Shogun Warriors, and he specifically named the Spark’s Dinosaur Playset. As we were traveling the Con, I was able to run into Wil Wheaton, the currently reigning King of the Geeks a few times. Sadly, I wasn’t able to get a picture with Wil, and I understand… away from his signing table, people were all over him and I did feel a bit intrusive, but he was kind enough to let me know that as a kid, he loved playing with a US 1 Fire Truck (circa 1983). Comics Colorist Alex Sinclair was a fan of GI Joe... more specifically the 3-3/4 figures from the ARAH (A Real American Hero) era in the 80's. Marvel artist Jim Cheung (Civil War) loved playing with the Secret Wars line of figures. At a draw for charity event... I got to meet Jim Valentino. I was a little star-struck. I doodled something up for the event myself (Ninja Turtle Raphael) and Jim Valentino told me my art was pretty good. My head about exploded with glee. At the same event, I got to hang out with '30 Days of Night' artist Ben Templesmith and his friend Xochitl Gonzalez; both great people. Ben spent the evening doodling on people's arms. He kept calling my stars and stripes GI: Joe tattoo my 'rainbows'. While not my first Con, I had a great time in Phoenix. I got to see some great costumes. I got to ask folks a poignant question. I hung out with friends and comic celebrities alike and I met some really great people that I can now call friends. It was a great experience. If you've never been to a Con, I really recommend you go to at least one. The guys here at OnePerCase will be hitting San Diego Comic Con in the near future. On top of that, yours truly will be hitting up BotCon within the next few weeks. Hopefully, I can bring more hard-hitting, celebrity toy love to you. Words, pics, stolen pics, and fanboy-ish-ness by Scion of Primus.